The Virginia Department of Environmental Quality referred the case to the attorney general in the last week of September after the property owned by Virginia True continued to be out of compliance with state law. 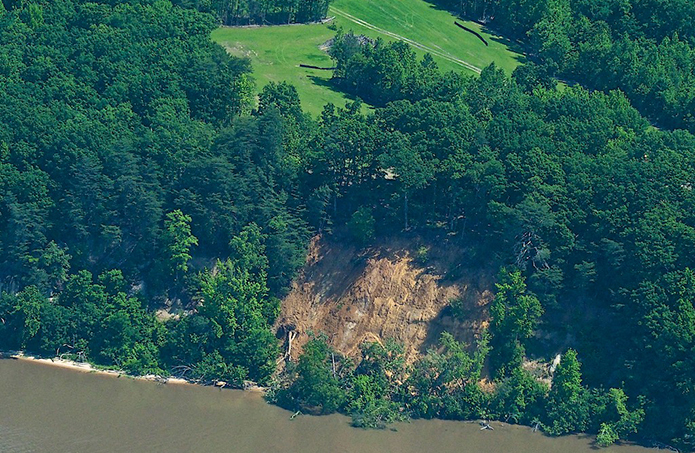 Last fall, Virginia True cleared more than a dozen acres of trees without permits not far from the more than 100-foot-high cliffs that are already prone to erosion. Since then, heavy rains have contributed to erosion on the land and were linked by inspectors to a landslide in late May on the edge of the property. The company’s Virginia-based lawyer, who is no longer with the project, said at the time that he wasn’t aware of the need for certain permits before beginning the land-clearing work. It took the company months to acquire the erosion and sediment control and stormwater management permits that should have been in place before the land-disturbing activity began. The DEQ issued three notices of violation to the company over several months and a consent order, which was signed by New York-based lawyer and Virginia True’s executive vice president, Howard Kleinhendler at the end of May. The order levied a $42,000 fine and required the company to submit weekly reports to the DEQ on its progress toward stabilizing the site. Jeff Howeth, a professional engineer based in Tappahannock, VA, was hired by Virginia True to get the site back into compliance and submit the weekly reports. Howeth said in late September that heavy rain throughout the summer made the work more difficult but that the cleared land was growing grass and mostly stabilized. “We've done — barring bad weather, which has been pretty horrendous — everything they've asked us to do along the way,” Howeth said. Conservation groups that had opposed the development during a contentious rezoning process in 2015 said the missteps made their fears about the project’s impacts come to fruition. They have urged state regulators to levy strong penalties against the company for repeated violations on a property with cultural, historic and environmental value. And they applauded Wednesday’s announcement from the Attorney General. “Today’s news from the Attorney General’s office makes me hopeful that we won’t have to say, ‘If only we had tried a little harder to stop the damage,’” said Kathleen C. Harrigan, executive director of Friends of the Rappahannock. The Chesapeake Bay Foundation also has urged action against Virginia True for unlawful activities “causing damage that has not yet been fully rectified,” Virginia executive director Rebecca Tomazin said in a statement on Wednesday. “Fones Cliffs is a site of immense environmental and cultural importance to Virginians,” she wrote. “Virginia True must be held to account for its flagrant disregard of environmental protections and the resulting damage." Land adjacent to the Virginia True site was also slated for development, until an early October announcement that the property is under contract to The Conservation Fund and slated to become part of a national wildlife refuge.